It’s a tagline that was born out of a crisis and it has been working wonders for the brand for two decades now. But beyond 2020, the brand may think of having a different tagline, keeping the basic spirit intact. In 1999, when tourists from different parts of the world were relating and equating Asian countries with the Asian financial crisis and the outbreak of Nipah virus, and consequently tourism business was nose-diving, Tourism Malaysia came up with the tagline- “Malaysia, Truly Asia”. ‘That new brand positioning did help us a lot in turning around and it has been working wonders for us for so long. But beyond 2020, we will set out a new tourism journey. We will roll out new tourism plans, new strategies, new campaigns, which are now on drawing board, to move to the next level and we may have a new positioning with a new tagline. But the fundamental spirit will remain the same,” said Datuk Musa HJ Yusof, senior director (international promotion division-Asia/Africa), Malaysia Tourism Promotion Board. Musa explained that the Malaysian population is divided into ethnic Malayees, Indian origins, Chinese origins, and among the Indian origins- South Indians and Punjabis are two dominating communities. Therefore foreign tourists get to discover a true Asian culture, ethnicity and spirit in Malaysia. All the TVCs, campaigns for Tourism Malaysia are therefore dubbed and translated in 16 different languages. 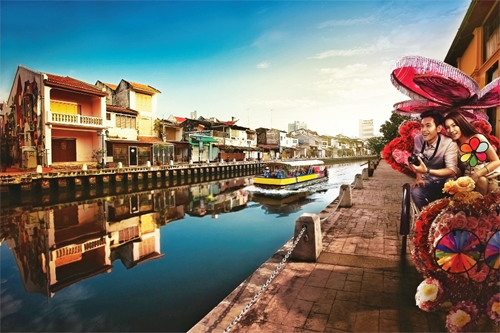 While drawing up its next round of tourism strategies, the Malaysian ministry of tourism and culture has identified ‘movie making’ as one of the most effective branding tools. “The making of popular Bollywood and South Indian movies like Shahrukh Khan-starrer Don, Rajnikanth-starrer Kabali at Malaysian locations helped us a lot in promoting our various tourism destinations. We are therefore laying utmost thrust on such movies being shot at different Malaysian locations. We are offering various sops, incentives and other facilities to Indian film makers for filming in Malaysia. There are already 12-15 such movie projects in the pipeline,” said Musa. He justified this move, saying that India is their biggest source market after China. In 2017, 5,52,739 Indian tourists visited Malaysia, which was 13 per cent lower compared to the previous year (thanks to some flight connectivity related issues). However, this year, the number of Indian tourists is expected to go up 15.9 per cent and reach 6.4 lakh and so far Tourism Malaysia is well on target. The other reason to focus on film making, according to Musa are the facts that 20th Century Fox has set up its first theme park/outdoor studio outside the US in Malaysia and Pinewood Studio has also set up its studio in that country. “The new brand positioning will also focus on destination wedding and MICE segments. Indians are increasingly spending on destination wedding and they are always on the look out for exotic locations with best of amenities abroad. Langkawi has always been hot favourite and now Sabah and Sarawk islands are also fast coming up as a great location for destination wedding. Then there is Desaru in Johor, where there is Ostrich Farm and a new 27-hole golf course has come up. Mind you, having a grand destination wedding in a Malaysian location comes almost 40 per cent cheaper than having it in some Indian location. We have also liberalized our customs and other norms to accommodate such wedding bashes here. We are therefore reaching out to wedding planners. Similarly, we are reaching out to Indian corporate houses of different sizes to have more incentive trips and conferences here. We are also reaching out to tier-II cities in India, which are coming up very fast,” said Musa. are available in Malaysia and while their children study here they can actually invest in properties to save on hostel costs, accommodation costs during parents’ visits and also earn some rental incomes at the same time.” Malaysian government has already received 943 such applications. With all these new initiatives, Tourism Malaysia is targeting an inflow of 1 million Indian tourists per year by 2020 and an overall tourism business of MYR168 billion from all countries together, he said. Interestingly, between Air Asia and Malindo Air, there are 222 weekly flights flying between Indian and Malaysian destinations, offering 37,000 seats weekly, which means there are 11,544 flights/year offering 1.9 million seats. Indigo will introduce its flights to Malaysia on November 15. Therefore, having 1 million Indian visitors to Malaysia does not look like a tall order, said Musa.